Samsung’s announcement of the Galaxy S III today has come after weeks, nay, months of speculation about what the hardware will look like from top to bottom. What size screen will it use, how big will the body be, and what cameras will it pack? Now all those questions have been answered, we are left with something possibly even more interesting than all of that – the software. Often used as a differentiator by Android phone makers, software is becoming a real selling point for many, especially when choosing which Android phone to buy above another. To that end, Samsung has added some new features to its flagship handset, and one in particular looks rather familiar. If you’ve got an iPhone 4S, then the chances are it’s very familiar indeed. S Voice is Samsung’s answer to Apple’s Siri. Both are digital assistants that promise to make our lives easier by allowing us to interact with our smartphones via the power of our voice. We are not just talking about voice commands here, but real spoken language commands that will, in theory at least, be interpreted by the handset and then acted upon accordingly. That’s the plan, anyway, but anyone who has used Siri will attest, it is not always the most accurate of things. 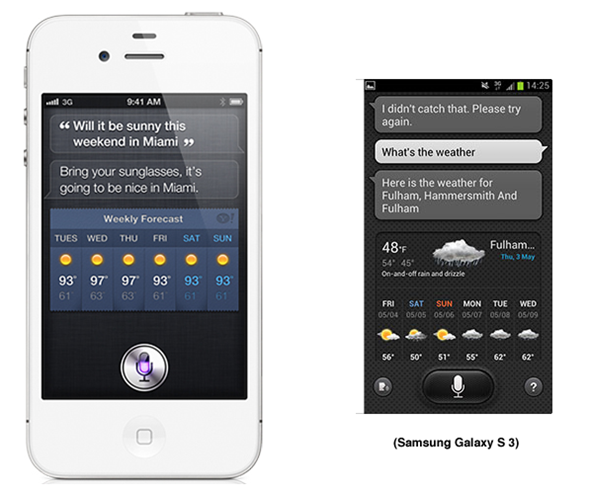 Which brings us to Samsung’s apparent rip-off knock-off version of Siri. From initial feedback from people that have been lucky enough to get their hands on the Galaxy S III at today’s event, S Voice is very similar to Siri in that it works in much the same way, but with some added bells and whistles that could actually prove rather useful. One of those bells is the ability to set a wake-up command that will unlock the device using just voice. The handset learns a user’s voice beforehand and thus can only be unlocked by that particular person. The theory here is that the feature is nice and secure, but then that was the idea behind Ice Cream Sandwich’s facial recognition unlocking feature, too, and we all know how easily fooled that is. Voice recognition and understanding is apparently on a par with Apple’s assuming your accent fits, and S Voice is undoubtedly streets ahead of the standard Android voice recognition feature that users have had to put up with until now. We suspect this technology will eventually feed back into Android at an OS level at some point, but until then it seems that Samsung has the upper hand across the Android platform. Whether S Voice has the chops to go toe-to-toe with Siri remains to be seen – we haven’t been able to test it ourselves just yet – but we suspect Samsung’s effort will fall foul to the same issues that have befallen Apple’s. Simply, real people don’t use voice commands in real, everyday life. The ability to wake a phone up using voice may go some way to changing that, but we won’t be able to answer that until real people start using the Galaxy S III in their real life situations. Until then, we’ll just have to sit back and await the inevitable legal battle between Apple and Samsung over just who has the various patents and such for a smartphone-based digital assistant. You know, because there aren’t enough legal spats going on right now. Well, instead of us emphasizing on the fact how awfully familiar S Voice is to Siri, we’ll leave it up to you – the reader - to decide and share your thoughts with us.